The Bibliobox is a travelling archive; it contains information about art projects in the rural context and can be folded out to reveal a small presentation. On invitation by a local host, the box can travel to a village and be opened out for presentations. Inside are films to be watched, books to leaf through and CDs to listen to. The programme of the presentation lies within the responsibility of the host. The host may be a local artist, an art institute, a farmer, the local fire department or a village group. What does the Bibliobox do? In a rural context, the box offers a broader view of people living in similar situations in other parts of Europe. It presents an opportunity for people to share experiences from art periphery to art periphery, also through the website. The box informs on the diversity of village life and art. It invites people to make their own contribution to contemporary art. Inhabitants of rural areas in the EU are being inundated with floods of images at the moment, but are rarely considered a potential audience for contemporary art. The Bibliobox can change this outlook. The first contents of the box were collected through contacts during the Village Convention in Ditchling (UK) 20-22 May 2005. The convention brought together practitioners from different European countries and was used to exchange and compare ideas about the production of contextual art in the rural environment. All participants are involved in arts projects that engage actively with the context and the public, and the content of the Bibliobox reflects that fact. In 2008 the box contains information on 75 art projects and has extended the network of myvillages.org with fresh contacts. The crate was created by Wapke Feenstra, in collaboration with a cabinet-maker. The box had to be practical and simple, and is constructed from plywood. Bibliobox and myvillages.org, are clearly marked on the outside; the inside is painted and has sections that can be folded out to construct a stand with a book display and DVD player. The box also contains a photo collection of previous trips. Electrical equipment and projectors need to be organised locally. A new crate can be added in the future, as the box expands on its travels and adds to its collection. Where does the Bibliobox go? The Bibliobox travels to a village or rural location. The box isn’t confined to journeys in Europe, of course. New and unexpected invitations and offers are more than welcome. All they have to do is cover travel expenses, contributions to maintenance costs and can generate fresh entrees for the box. Additional financial contributions to the crate will help speed up the online archive and go towards the construction of new bbboxes. Sponsorship also remains a source of material for the box’s contents. 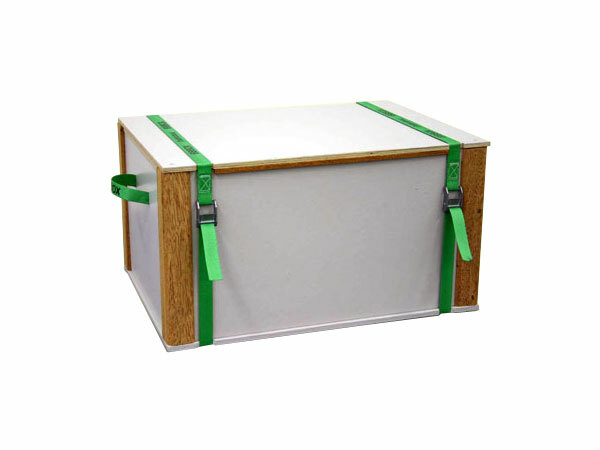 To keep transport costs to a minimum, the box can be transported by standard means of transportation, weighs meanwhile more than 65 kilos and is fitted with handles.